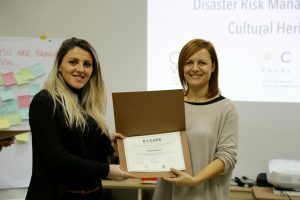 Three offices of Cultural Heritage without Borders in Albania, Bosnia and Herzegovina and Kosova, organized the “International Training on Disaster Risk Management for Cultural Heritage”. 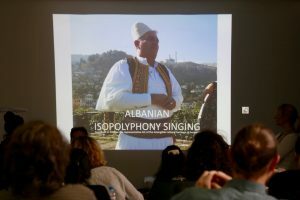 The training hosted 28 professionals of museum, heritage and disaster risk management practitioners coming from Western Balkans, Eastern Europe and the Middle East. The three-week training programme started in Sarajevo, at the National Museum of Bosnia and Herzegovina, and it focused on different simulations about the preservation of museum artefacts in situations of flood, fire or human neglect. For Aida Salketic, program manager at the CHwB Bosnia office, the training in Sarajevo was very successful. “First of all, we introduced the participants to the training and disaster risk management cycle and practices. We focused on museum collections and museum practices through lectures and also simulations of first aid and evacuation of museum objects after disaster”. Ms. Salketic, who is also an art historian, also praised the strong teamwork all throughout the training. During the second week in Prishtina, participants applied the disaster risk management cycle in an urban context, trying to answer questions such as how does disaster risk management fit into the integrated planning of historic cities. Nol Binakaj, deputy-head of CHwB Kosova office, says that the training met their expectations. “For a week we tried to identify the values of Prishtina city center. While assessing the object we also included the new monuments such as Newborn or the Palace of Youth. Through this we wanted to show that not only the old monuments have values”, he emphasized. For Mr. Binakaj, who is also an architect, “the diversity of the participants, as for their countries and educational backgrounds, gave to all the opportunity to exchange views and ideas. Moreover, the training helped the cultural connection of the participants. This kind of relations that is created during these activities, helps smoothing the divisions, regionally and not only”. The third and final week of the training was held in the museum city of Gjirokastra, Albania. 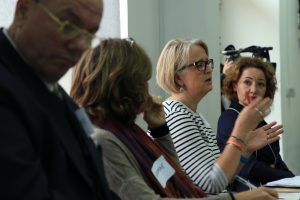 Elena Mamani, vice-director of CHwB Albania, highlighted the fact that the program combined both theoretical lectures from regional and international experts with practical field exercises designed to reflect situation and test participants’ knowledge. 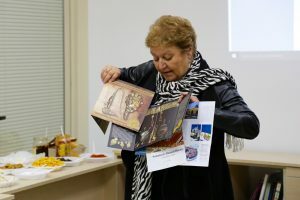 “The goal of the training is for heritage professionals or participants with other profiles, to learn practical skills for cultural heritage protection and preparedness. “Participants studied different methods and strategies to preserve intangible heritage. Some of the most important topics that were discussed were: assessing the risk for intangible cultural heritage, the importance of documentation for this heritage, etc.”, said Ms. Mamani . An important part of the training, which also gained the attention of the local community, was the discussion panel on how can culture and heritage support humanitarian response and vice versa. Part of the panel were: Birgitta Jansson, Head of Development Cooperation, Swedish Embassy in Tirana; Xhuvanaq Gjylameti, Director of National Emergency Operations Centre, Ministry of Interior Affairs; Sonila Kora, Directorate of Tangible Heritage and Museums, Ministry of Culture and Catherine Antomarchi, Collections Unit Directorate of ICCROM. They discussed, among other things, about providing more training opportunities for creating volunteer networks and integrating local views and values in human response. To help the interaction between participants, a culture night was organized during the week. Participants came together as ensembles to show off their beautiful culture, which was reflected in their songs, dance and poetry. The event that was also accompanied by musical and dance performances truly manifested the unifying spirit of our cultural diversity. This three weeks training was organised within the regional project Balkan Cultural Aid Response for Emergencies (B+CARE). B+CARE is a platform founded in March 2016, in order to inspire, train and coordinate volunteers for the work of preparing and assisting in the event of a cultural emergency. B+CARE is funded by the Prince Clause Fund for Culture and Development from the Netherlands and the Government of Sweden.